Born to a Christian mother and pagan father at Tagaste in North Africa, Augustine was a confirmed Manichaean during his early years as a student and teacher of rhetoric at Carthage and Rome. But in Milan, during his early thirties, he began to study Neoplatonic philosophy under the guidance of Ambrose and eventually converted to Christianity. An account of his early life and conversion, together with a reasoned defense of his Neoplatonic principles, may be found in the Confessiones ( Confessions ) (401). He was named the Christian bishop of Hippo (Annaba, Algeria) in 396, and devoted the remaining decades of his life to the formation of an ascetic religious community. 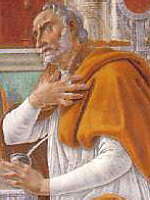 Augustine argued against the skeptics that genuine human knowledge can be established with certainty. His explanation of human nature and agency combined stoic and Christian elements. But it was by reference to the abstract philosophy of Plato that Augustine sought to prove the existence of god. Acknowledging the difficulties of divine control and foreknowledge, he used an analysis of the nature of time to defend human freedom in De Gratia et Libero Aribitrio ( On Grace and Free Will ). In De Civitate Dei ( The City of God ) (413-427) Augustine distinguished religion and morality from politics and tried to establish the proper relations among them, arguing for the church's strict independence from (if not its outright superiority to) the civil state. You might be interested in viewing portions of a Dutch library's copy of a fifteenth-century illuminated manuscript of this text. Michael Mendelson's article in The Stanford Encyclopedia of Philosophy.